Emily Oeser plays Overwatch for SUNY Canton. Canton hopes that its esports program, the first in the SUNY system, further distinguishes the (very) upstate school to attract prospective students. Getting students to compete in esports could help keep them around, too. SUNY Canton’s athletic director Randy Seminksi told Kotaku that some statistics show that student athletes in traditional sports have better retention and higher graduation rates than non-athletes. Seminksi hopes that involving students in digital sports will have the same effect. The esports collegiate scene is still in its Wild West phase, which means that smaller schools can capitalize on the trend and stand out. ESPN’s list of collegiate esports programs counts 85 institutions of higher learning in the US and Canada, including junior colleges and for-profit universities. Many of them, including SUNY Canton, belong to the National Association of Collegiate Esports (NACE), a varsity-level competitive league which is positioning itself as the NCAA of esports. NACE has no divisions (yet) to separate schools by performance capability, nor does Blizzard’s Tespa organization. SUNY Canton’s League of Legends team. This means that squads out of lesser-known schools get matched up against teams from colossal state and private universities. 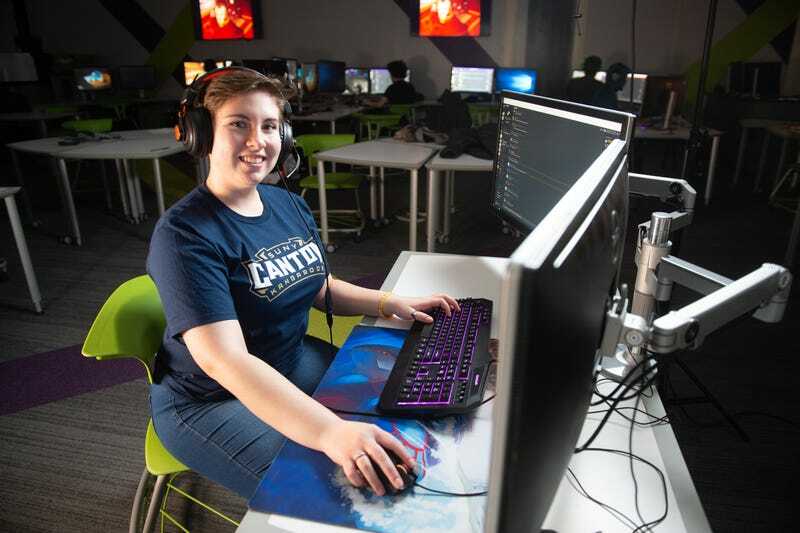 Some of Canton’s esports teams already went up against what SUNY Canton’s esports coach Rob Snow described as “some real giants in the collegiate athletic scene” during the school’s first competing semester this spring, leading to tough matches for the smaller school’s newer teams. In the future, these larger schools may get slotted in a higher competitive division than smaller schools, since they’ll have more funding and infrastructure to accumulate talent. Some college esports staffers see differences emerging between smaller and bigger schools. “Unlike traditional sports, the advantages of bigger colleges differ. But mainly, they have a tendency of larger recruiting budgets and staff,” said Jonathan R. Neely, esports coach for the Maryland-based private Stevenson University, which boasts around 4,200 students. Others don’t see much of a difference yet in either talent or technology between schools of different sizes. Averett University, the first four-year university to add esports in Virginia, recently finished its first year of competitive gaming, mostly in 1v1 school competitions, in NACE and Collegiate Starleague. Smaller universities may not be able to, say, use esports scholarships to lure high-skill players. What they can do — and have been doing — is use esports to recruit, retain and please students who are often already clamoring for their school to play at the collegiate level. Outfitting a handful of high-end computers could be much cheaper than maintaining traditional sports programs, so smaller schools can inexpensively start their esports programs and not suffer much of a disadvantage against institutions with more resources — at least for now. When Chris Towle was brought on to coach esports for the Vermont-based College of St. Joseph in 2017, only a few students were interested. Before that year, the school didn’t even have an unofficial team or gaming club to build from, so Towle had to start from scratch. By the end of the year, St. Joseph had over a dozen students training up on different titles. That’s a big deal for a school of 350 undergraduates. The school barely stayed open due to financial concerns, but the esports team kept on training, though they’ve stayed out of competition. At schools like College of St. Joseph, administrators see the esports industry’s potential and want to give students a non-“traditional athletics” way to involve themselves with the school and community. For some students, esports can change their entire college trajectory. Emily Oeser came into SUNY Canton in fall 2017 intending to finish her general requirements and transfer elsewhere to pursue a music degree. But then the school announced its esports program. Already an Overwatch fan, she’d been playing more and more with an eventual goal to get picked up by a pro team. Joining the school’s squad offered her the chance to start playing competitively right away. Oeser switched her major to the school’s game design program, which had powerful enough computers for Canton’s nascent team to start practicing on. The smaller college has even bigger plans for its esports team: A $250,000 dedicated arena, currently under construction. It’s one of several gaming-dedicated spaces that small colleges have begun to build. Many use the term ‘esports arena,’ although that can range from setups like College of St. Joseph’s with five or six new computers, to cavernous halls with dozens of machines like UC Irvine’s. Canton’s planned space will sit in between those examples, with 25 new rigs outfitted with serious consumer hardware (1080 ti Founder’s Edition video cards, 32GB of RAM, 240hz refresh rate monitors, etc) and a secluded backroom that could be used for esports coaching sessions. These dedicated arenas let teams practice whenever they want instead of sharing time with students who need powerful computers for their coursework. Basketball players have their courts, football players their stadiums, and esports arenas — however small — indicate that these schools have carved out a similar practice space for competitive gamers as well, to refine their skills, host tournaments and become a nexus for an on-campus gaming community. Canton believes its STEM-focused students will rally around the arena and that gaming will become a bigger part of their school culture. To that end, the school spent $1.5 million overhauling their internet to extend low-latency, online gaming-ready Wi-Fi across the campus and out to the athletic fields. The school is even considering a gaming-focused dormitory wing. The current state of collegiate esports features a lot of online-only tournaments, meaning that players are not forced to travel in order to compete, keeping a team’s overhead minimal. Esports can thrive at remote schools with modest resources in ways that traditional athletics cannot. 90 percent of Canton’s esports teams have on-campus players, with the exceptions living as far as Florida. Given enough interest, esports coach Snow said, Canton could field teams stocked entirely with remote players. Being on the frontier means schools don’t have to adhere to traditional sports norms. When Snow announced that Canton would be fielding an all-female team, female players immediately reached out to him. “It’s definitely something that people wanted, maybe silently wanted, and that was realized when we made the announcement,” Snow told Kotaku. While the program’s Overwatch squad is co-ed, enough women signed up to play Blizzard’s hero shooter that Canton was able to create its female-only squad. They haven’t played in a league yet and are set to debut in the fall, with student Emily Oeser as captain. Canton isn’t the first higher-ed school to field an all-female esports squad in the US. That honor likely belongs to Missouri’s women-only, 850-student Stephens College, whose Overwatch team started competing with other colleges last fall. Stephens’ trailblazing first season offers a rare look at the challenges smaller schools face in starting up teams with rosters of variably-skilled players. Stephens hopes to both improve the area’s esports scene and set up a talent pipeline by helping local high schools develop their own esports programs. In the meantime, Utterback says student applications for the esports team keep rolling in. Not just to play, either: some are looking to commentate on matches or operate the in-game camera for broadcasts. These secondary roles may not makes headlines like pro players do, but these are essential occupations in the esports world, and guiding students to them is another way for schools to justify starting esports programs and teams. Prospective SUNY Canton students have had similar interests. “Anecdotally from the students coming in the fall, they run the gamut. I have people who really want to be streamers, who are creating content now and want to create content for SUNY Canton,” said Snow. Esports in higher education could mimic the traditional collegiate athletics model of funneling talent into professional teams, but given that pro gamers tend to retire by their early 20s, would-be esports stars might want to consider multiple career options. For her part, Oeser dreams of being scouted by a professional team as a junior or senior. But if she doesn’t make it to the pro leagues, she wants to change esports in another way as a game developer. Although collegiate esports programs compete with one another, they’re also working together to improve the scene as a whole. “Another thing that I found incredibly interesting about esports: We’re in it now for the love of the game. I talk to coaches like those at Harrisburg, University of Miami-Ohio — we’re all willing to reach out, help each other out and develop each other’s programs. So for now we really are in it for the love of the game,” said Snow. After getting tips from other schools’ athletic directors, Canton is starting to reach out to its traditional sport athletes to see if they want to get in on esports. Turns out some of them like playing their sport off the field and come home from soccer or basketball practice to play FIFA 2018 or NBA 2K, respectively. That all depends on where esports goes and how it evolves, which is completely out of higher education’s control. “No doubt three or four years from now, we’ll probably be playing a game on campus we haven’t even heard about yet,” SUNY Canton’s athletic director Seminski said. But they’ll roll with that, just like all the other budding esports programs at schools elsewhere. For once, colleges great and small get to be on the cutting edge.